Joe Teresi is one of those people who can tell you what a box culvert is. He can also tell you what Midtown was like in the 1950s and 60s because it's where he grew up. He remembers that you could hear the frogs in Matadero Creek and often see numbers of them hopping across the road. Every house had kids and there were "always about 50 kids playing" in the cul de sacs and streets. Hoover School had an after school program with board games and crafts and frequent carnivals. Traffic wasn't a big concern. There was a donut shop at Middlefield and Loma Verde. The Teresis' first Palo Alto home, in between Middlefield and Ross Road, was bulldozed in the early 1960s to make way for the Oregon Expressway. Joe Sr. and wife, Mabel, still live on Wellsbury Lane where they moved the family then. As a Bellarmine student, the future Berkeley civil engineer would bike to the California Avenue train station and catch the train to school. On family outings in the car, however, it was Joe who his father counted on to read the maps and navigate. 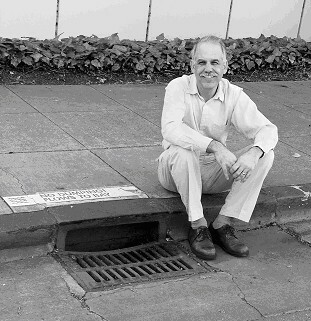 Well known today as the Czar of Palo Alto Storm Drains and a 21 year member of the Public Works Department, Joe spent a brief stint with CalTrans before coming to the city as a multipurpose engineer. He initially worked on creating Greer Park. Besides the Matadero Creek frogs, Joe has a vivid memory of the swimming pool at Chuck Thompson's where he almost drowned when he went too close to the uncovered grate in the deep end. His arm was sucked in up to the elbow, creating a vacuum from which the lifeguard couldn't release him. Luckily, a manager was on hand and threw the pump switch in time. The following week, Joe was back swimming at the pool. Many years later, when the City took over Chuck Thompson's and the pool was being demolished in the 1990s, he got to swing the first sledge hammer as his parents, his colleagues and the press cheered. Now a resident of Millbrae, Joe is President of the Music Boosters at Millbrae High with his wife Shari, a substitute teacher, and his son Chris, a saxophonist and future animator. Daughter Karen, who followed her dad to Berkeley, is studying to be a history teacher. Much cheered himself by the recent passage of the Storm Drains Measure in Palo Alto; Joe said of his fellow Public Works colleagues, "We all try to do a good job. I wish people would appreciate us."